I guess I'd be surprised if I didn't see this coming over a year ago. Young voters have come a long way, but we still haven't learned that change takes commitment. President Obama's election became historic, not just based on his race, but based on the millions of young voters, and first time voters who came out to the polls. His campaign started what looked like a positive trend of people being more active in politics. However, the recent no-show for state and local elections showed that people must think politics end with Obama. In states across the country, millions of voters who cast ballots in the 2008 presidential election were missing. This absence helped Republican's win some crucial governor's races in states like Virginia and New Jersey. Here in Atlanta, not even 25% of the registered voters showed up for the city's most important mayoral election in years. 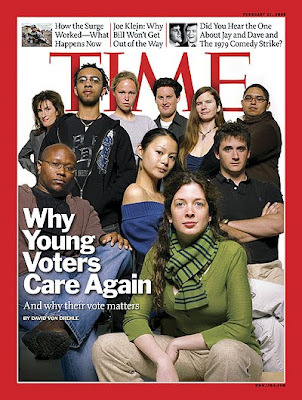 The problem with most of the young and first time voters not showing up to the polls, is that most of them are minorities, and that vote is as important in today's politics as they were a year ago; maybe even more so. Barack Obama getting elected to the presidency was not the end all be all of American politics. The state and local elections shape this country just as much as national government does. As we disregard these elections, we risk losing the change that we all sought out when we voted for President Obama.